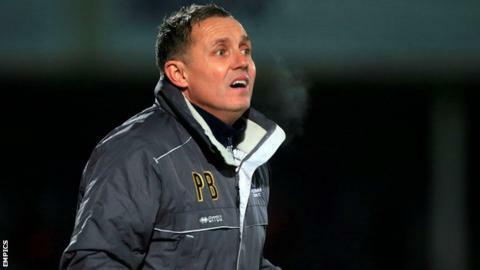 Paul Buckle will remain as Cheltenham manager but his position is "under scrutiny", according to the club. Buckle has lost seven of his 13 games in charge to leave Town one place above the League Two drop zone and reports on Wednesday suggested he could be sacked. But chairman Paul Baker said it was "business as usual" at the club. "I did meet with Paul but unfortunately [the papers] are less well-informed about the outcome of the meeting," Baker told BBC Radio Gloucestershire. "Clearly I'm concerned about the situation. No one wants to be where we are. "Paul has been in place a short amount of time. We've just started seeing some new players coming into the squad and we've not seen them bed in yet. "But we're not complacent. His position is under scrutiny. We have regular meetings and he knows he's under scrutiny but he's inherited a difficult situation." Buckle replaced Mark Yates as boss in November and took over with the club 18th in League Two. The Robins have since taken eight points - with only one win - and Tuesday's 2-0 defeat by Southend left them 22nd, one point and one place above York, who are in the relegation zone. "We don't always get appointments right. I know I've made mistakes in the last 18 years," continued Baker. "At the moment I want to try and give Paul the best opportunity. We've got to look at the players too. "The players are the ones who cross the line and have to play to their best. I just hope now that the new players will come in and establish themselves." Buckle returned from a stint in the USA to take the role at Cheltenham, having previously managed Torquay, Bristol Rovers and Luton. He has shaken up the squad, releasing Steve Elliott, Terry Gornell and Byron Harrison and bringing in four new players on transfer deadline day in January. But their form has not improved and Buckle admitted on Tuesday it was going to be a challenging job. "I was under no illusions when we came in about how hard it was going to be," he said. "There's a reality to the players now that it's a serious situation. "I've not taken over something that's on the up. I've taken over something that's on the down. I'm doing my best to improve it."